Hi there, I am a beginner level welder. I have attended two courses for welding now. I have learned all the basic information to start welding. My father owns a business which includes, a crew of fifteen people going to a shipwreck including me. We go there and look for left-over furniture and cabinets. Now, our job is to restore the goods we get from the wreckage and sell it in our shop. In the restoration process, welding cabinets and steel wardrobes are a common thing to do. My father and my uncle are in charge of welding. As my father is getting old, and he is planning to retire from welding work. So, it has been one year that I am taking courses in welding to make him retire. I use the method ‘flux core’, to weld thin metals, as the cabinets and steel wardrobes are made from thin metals. 3 What is Flux Core? 4 How to Weld Thin Metal with Flux Core Welding? Before 1950, the common welding use for thin metals was Shielded metal arc welding (SMAW), in the mid-1950s, the development for Flux core welding was achieved. The advancement coming from Shielded metal welding to Flux cored was remarkable. In the shielded metal arc method, it uses stick electrodes unnecessary. This helped in overcoming many of restriction associated with SMAW over FCAW. Working with welding can be very hazardous if you do no take safety measure in the working site. Not putting enough effort on the slightest safety can make a huge accident or even life-threatening. Choosing the right equipment is a must, because while welding, particles, metals, UV radiation are formed. Exposure to the human body can cause fatal or major injuries in our organs. Flux core is a welding process which uses a tubular wired electrode with a flux filled encore; it is also addressed as Flux cored arc welding (FCAW). The Flux cored arc welding uses similar or identical instruments use in MIG (inert metal gas) welding. However, flux cored arc welding can also be performed without shielding gas. MIG welding is much less of a productive process than the Flux-core arc welding. Well, FCAW is considered as the most productive manual welding process. How to Weld Thin Metal with Flux Core Welding? While you’re in the welding process, the arc is used in uniting a continuous filler metal electrode with the base material. The flux-filled wire electrode is then automatically fed through the center of the flux gun, which is partially the same method and the equipment is also the same that is used in Metal Inert Gas Welding. The gas shield of the welding is supplied by the guns that protect from getting oxidized. The electrode containing the flux creates a slag (smelting refuse) that covers and protects the weld from the atmosphere. 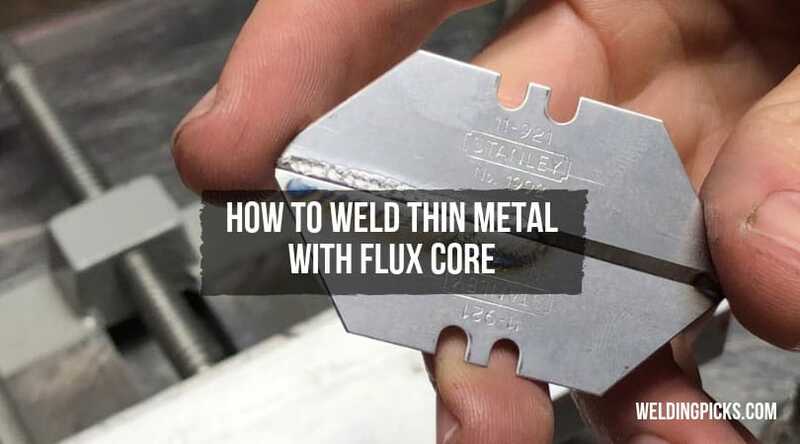 Flux Core welding is a fun and easy process for beginners. It can be carried around, as it is not mandatory to use shielding gas for the welding. Options are available, for shielding gas or not to use shielding gas. It is very popular in the welding society; spare parts are widely available. It can weld metals which aren’t completely clean, also can penetrate thicker metals. Gas Shielded flux cored wires can provide a good middle-ground. The welding is suitable for any outdoor environment, which includes breeze or heavy drafts, unlike gas welding it won’t be blown away. Complex welding cannot be done with the basic flux core rig. The process of welding can be slower than the Metal Inert Gas Welding (MIG). Compared to other simple welding method, Flux core can get a little expensive. Creates more fumes than other welding processes. Wire feeding is relatively tricky. Life is not a bed of roses; we live by our code of conducts. We should be convenient in all aspects of our lives. Just like that, a welder should be timely, time-saving and precisely accurate in work. In my thoughts, I would say flux core welding is a pretty basic welding. To avail this skill, an individual is not needed to spend hundreds of hours to learn a simple welding skill. Moreover, Flux core wire is 10% higher than of the solid wire’s, more than 50% higher than arc welding. Flux cored welding’s efficiency for thin metal is about as high as 85% to 90%, so it ends up 1.5 to 2 times than the solid wires and a whopping 5 to 8 time more efficient than the shielded metal arc welding. So, after all the analysis, I could proudly say, even though my father owns expensive welding rigs, I go back to Flux core welding for its efficiency.